← Day 335 – RIP this shirt ITS LAST WEAR EVER! Day 335.2 – Put a star on my head and call me Christmas! How could I resist this red Portmans dress and some green Christmas tree beads for the Annual Radio Lollipop Volunteers’ Christmas party?! Suddenly realised that all my playing photos from the party celebrating another year of making kids in hospital smile were a bit dark and you couldn’t actually see my dress (hence the above photo!) but boy did we have fun! This dress sure has a lot of tales to tell since being purchased around 2002 and coming to Hong Kong and back. A friend in Brisbane always used to say to me: Oh no not that dress! I thought we were going to have a quiet night! 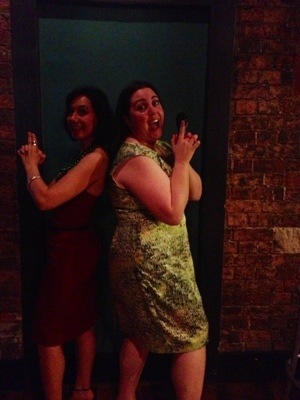 Yep it is true – this dress knows how to have fun and loves awesome Charlie’s Angels poses! Posted in casual, character outfit, fashion and tagged Christmas, Radio Lollipop, spring. Bookmark the permalink.